“An oven pan laden with delicious food (a LOT of it) that is cost-effective. Very easy and delicious. Slice sausages into thin rounds, about 1/5″ thick. Cut potatoes into 1/2″ chunks. Place all ingredients on baking sheet and drizzle oil over. Toss everything together in the oil, making sure everything feels coated. Add salt, pepper and spices. 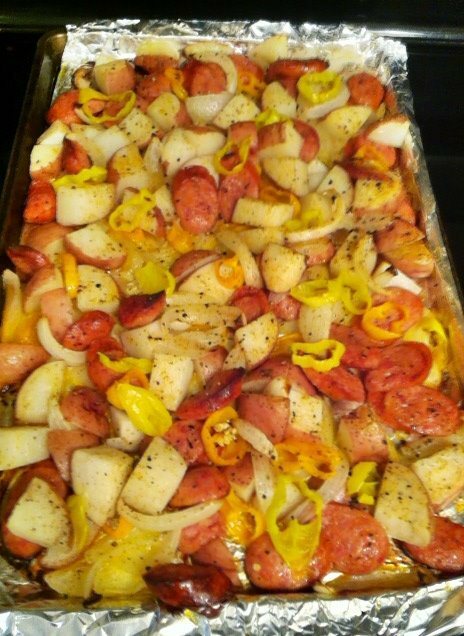 Top with sliced banana peppers. Bake at 400°F for about 30-35 min or until potatoes are tender.